With ‘1194D’ the US-based artist Raven Kwok offers us a peek into a digital landscape and the unpredictable behaviours of it inhabitants: algorithms. These computational processes are operating the communication and transport platforms we use in our daily lives, but they are functioning out of our sight. 1194D visualises the behaviour of a certain type of algorithm. 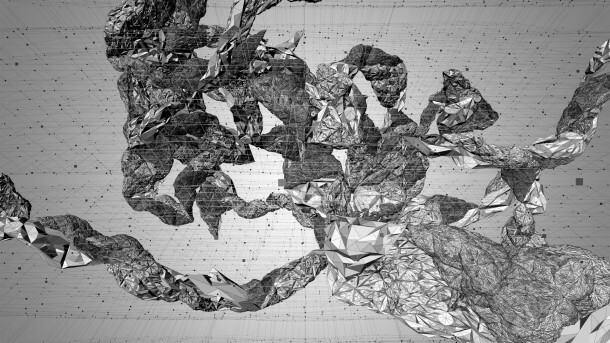 With the use of a technique called ‘recursive triangle subdivision’, Kwok creates his algorithmic creatures, which are based on biological processes. For us it’s hard to pin down their actual shapes: one moment they look like sculpted digital versions of coal or aluminium foil, the next moment they come close to living creatures. The idea and complexity of the work started to go beyond the initial expectation after Kwok decided to experiment with multiple “creatures” co-existing within the environment. Raven Kwok (aka Guo, Ruiwen) is a visual artist and creative programmer, whose artistic and research interest mainly focus on exploring generative visual aesthetics brought on by computer algorithms and software processes. He studied photography and received his Bachelor of Arts at Fudan University Shanghai Institute of Visual Art, and had been working as a self-taught animator and programmer far before that. In 2014, he graduated from Rensselaer Polytechnic Institute with the M.F.A. degree in Electronic Arts. 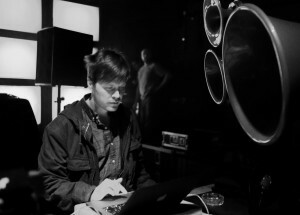 His master thesis project ‘Algorithmic Menagerie’ was a simulated computer-based ecosystem inhabited by different kinds of self-organized but also interconnected cellular structures.